Saturday night we went to see Thor: The Dark World at the local movieplex. I did not have high expectations as the first Thor film was enough melodrama for a lifetime. Don’t misread me, though, The Avengers was good. It’s just the Thor brand (okay, and Iron Man 2 and Iron Man 3) that I find awful. The film is visually stunning and the actors are all wonderful and beautiful to look at and seem to know their craft. Thor’s problem is one of screenplay and pacing. It is a literary problem. Here is why it fails. Each character is a cliché. As I watched the movie I kept thinking, “Who wrote this dialogue? A sophomore girl in English class?” The dialogue is so bad and the character development so shallow that even great talent like Anthony Hopkins, Renee Russo, and Natalie Portman come across as wooden. The bad guy is almost literally just a mask. It’s like the folks over at Marvel said, “insert bad guy here” or something. Why does he want the darkness? Where did he come from? Does he love his mother? Is there a Mrs. Bad Guy somewhere? Which lead us to the biggest cliché problem—Thor himself. The only thing he has going for him is the mythic power and hammer. Nothing, and I mean absolutely nothing about him as a character or personality is developed. Even the long awaited reunion with Portman is tragically weak. Does he have any emotion? Is there any flaw in him? He’s just a giant cardboard cut-out. Writers know that titles are important. You want to give your book or story a title that will make someone pick it up and at least consider reading it. 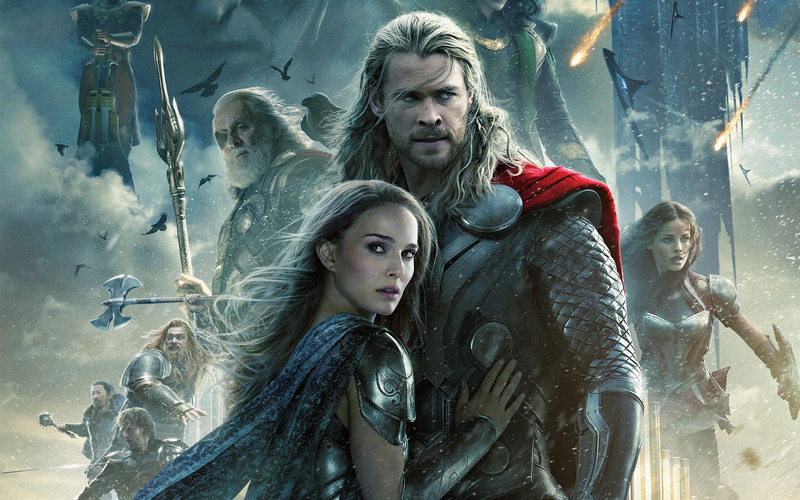 Thor: The Dark World seems a little copycat at this point. I mean, is it Thor Into Darkness or maybe Thor The Dark Knight? Edge of Thor’s Darkness maybe, or even, how about this, Dark Thor: The Ascent? I’m not even on payroll and I can think of at least 3 better titles that don’t have the overused “dark” motif going on—Thor’s Grief, Thor and the Fight for Light, Thor: The Alignment. I think any of those are good. I resisted the urge to go with Thormageddon or Thornado, which would be like Sharknado but with aliens. Proportion is a major aspect of writing. This film loses all sense of proportion. If the title were not Thor one might think that the main character was Odin or Loki. Loki is great and Hiddleston plays him superbly. His character is developed and therefore it connects with everyone in the audience to such a degree that we actually root for him. He might be a bad guy, but the movie would be far more interesting if he were running things. The proportion here is so out of whack that the only thing I’ll probably remember about this movie in 2 years is the intern and the intern’s intern. Maybe the title should have been Thor’s Intern? Show—don’t tell. This is the number one thing writers hear from critics, agents, and editors. It is easy to write a make believe history as exposition for your audience. The problem is that is usually boring. The harder worker is to intertwine these histories in the aspects of plot, dialogue, and character interactions. This movie has so much exposition, especially at the beginning, that I felt like I might ought to pull out my iPad and take notes. I’m still a little iffy on exactly what ether is and what it does. Plot matters almost as much as character (and this is a great debate, but for now let’s just agree that plot is important) but Thor spends very little time working out a consistent plot. Is this an invading army movie? Is this a romance? Is this a Cain and Abel story? Are we looking at a space battle or a fantasy tale? At times the movie felt like Lord of the Rings and at other times it felt like Star Wars and then it suddenly feels like Power Rangers, oh wait now it wants to be scientific like Contact. The sad thing is there is room in here for a powerful sub-plot about the effect of lose—a mother, wife, lover—and how it changes us but that never really gets developed other than clichéd tears. Which, by the way, how about this for a major plot hole—if earth is the best place in the 9 realms to bring ‘darkness’ why was not the first battle so long ago fought on earth instead of whatever that planet is that looks like Arizona at dusk? I forgot to tell you the best part about Thor, though—the X-Men Trailer. I’m just ready for the next Avengers movie! Also, I can’t wait for the Superman vs. Batman flick. That’ll be geek-tacular. Me too david. It would be geek fest if we could see them together. Actually I thought each of the super-heroes, individually, were boring. When they all got together in The Avengers then they transformed each other into something interesting. Actually, it’s quality was due to Joss Whedon, perhaps the best tv writer out there. Did you see “Dr. Horrible’s Sing Along Blog”? He wrote all the music for it as well, and it is possibly his best work in my opinion – though the necessary sequel is still coming. Joss Whedon even made vampires fun with Buffy and with Angel. Though the abundance of abysmal vampire stuff – i.e. all of it – since then was an unfortunate result. “Firefly” was fairly good, but “The Dollhouse” was too dark for me. Quite apart from super-heroes, one more recommendation and I will leave you in peace, The Vlog Brothers have done a 110 (!) part series on YouTube called the Lizzie Bennett Diaries which presents Pride and Prejudice in a delightful way. Each episode is only three or four minutes long. They are genius in the things they do. thanks for the recommendations! i agree that whedon is a genius. Previous Previous post: beard facts.